At the CPMT meeting in France last year, Lama Zopa Rinpoche suggested that FPMT has many great centers and an excellent education department with many good programs and that now it is time to focus on retreat – to gain the realizations. As the director of a retreat center at the time, this was music to my ears. Why do we rarely take the time to actually discover the true nature of reality – the one that frees us from suffering now and for evermore? Is it because we don’t think we’re suffering? Or perhaps, by keeping ourselves busy,we don’t have time to look at it. Most of us believe that if we work hard enough, some day we will have the time and resources to really practice – to do retreat. I tell you, my friends, “some day” will never come by itself. Dilgo Khentse Rinpoche once said that “to understand the value of this human life and waste it blithely on distractions and the pursuit of worldly ambitions is the height of confusion.” What keeps this mind in confusion? Buddhism would say that it is the habit of the mind, that we are forced by karma and delusion to see our world the way we do and to behave habitually as we do. And we have been doing it since time without discoverable beginning! Are we tired yet? We all wish for happiness, but the faulty assumptions by which we live our lives don’t afford us what we seek. It is only through examining our mind and uprooting our enslaver that we can plant a garden of joy. Our Dharma centers play a key role in providing the tools of discovery. Rarely does one find an environment conducive to cultivating a “retreat attitude” – one that is mindful and subdued, content with few wants. Dharma centers can be of great benefit by creating an atmosphere where people may come to immerse themselves in a quiet, contemplative place filled with warm-hearted, kind, loving, compassionate and quiet practitioners – those who are obviously working to subdue their minds. Six months into retirement and heading for a long retreat to begin at the end of the year, I shared my thoughts with FPMT’s former Center Services director, Doris Low, who said to please write something for Mandala so other centers will know it is possible – hence, this article. I don’t have to tell you that the nature of life is change, right? Rarely do we see it so well exemplified as in a Dharma center. 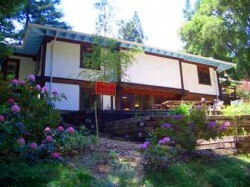 During my tenure as director of Vajrapani Institute, there were many changes: physical changes – remodeling buildings, beautifying our landscape, changes in personnel – and most profoundly, changes in behavior. We created a “retreat culture” that was palpable when people came to the center. Although they might be unable to articulate why, they immediately experienced a sense of peace. Astoundingly, one woman who attended a retreat given by another tradition who had rented the facility said, “When I came to this place I felt like I had come face to face with God!” This and many other similar accolades, gave us the courage to continue what we knew was cultivating this sense of peace. So what was it? It was cultivating quietude, mindfulness and loving-kindness. One of our staff was quite keen to practice silence. Through her strength of conviction and our wish to support her in this practice, we implemented the ringing of a “mindfulness bell” on the hour, every hour, between 10 and 4. We would explain to guests when the bell sounded that now we were going to sit quietly for a few minutes. This act of physically stopping, sitting with whatever practice one was working on at the time, then continuing with the work at hand, began to make a remarkable difference in the pace. We began to train ourselves to slow down, remember why we were there, and at least for the next few moments, to be mindful of our purpose. When “frantic” would appear, it stuck out like a sore thumb and was easier to uproot. This cultivation of mindfulness made the cultivation of loving kindness, compassion, support for our visitors, and even the mundane work of the day, a practice itself. We created a list of values by which to live and work, defining the bedrock of our spiritual community, holding us accountable to ourselves and to others and as a pole star, providing direction by which to steer, inspiring us to embody effort and intention moment by moment, thereby becoming living pole stars ourselves for the benefit of all. Listed below, we kept these values alive by posting them around the center and visiting them during our staff meetings. WISDOM: Where mind awakens; Developing awareness of impermanence and interdependence. LOVING-HEARTED: Where kindness is; Warmth and kindness towards self and others through sincerity, openness and generosity in time, headspace and heart. SPACIOUSNESS: Where all expands; Going beyond one’s personal agenda through cultivating a flexibility and expansiveness of mind. CLARITY: Where vision is present; Focused, centered and aware in all actions of body, speech and mind. TRUST: Where friends share; Being honest with oneself and others while holding patience and faith in the unfolding; inspiring trust in others by being dependably real. Additionally, we instituted a policy of functional speech, particularly in the mornings, refraining from mundane chatter that fills up the airwaves. And we developed the habit of sitting quietly while waiting for a meeting to start and continuing that quiet sit together for a few minutes prior to establishing our motivation. Believing in the efficacy of retreat, we created a January “rains retreat,” closing the center and supporting the staff to enter into their own personal, solitary retreat. Those who served as support for the January retreaters were given the option to retreat in February. Additionally, created by all our stakeholders, our vision and mission statements pointed the way for our strategic plan that included a three-year retreat facility with a resident yogini/yogi/teacher to serve as mentor and guide. A retreat culture is taking deep root at Vajrapani Institute, largely due to the dedication of those who are holding the space. It is those who work and volunteer at the centers who set the example, who embody the values, who are the shining pole stars to emulate. Alan Wallace mentions a comment from a Tibetan doctor he knows who remarked about Westerners, “From the perspective of Tibetan medicine, you are all suffering from nervous disorders. But given how ill you are, you are coping remarkably well!” Let us move beyond coping into great joy. Let us transform our centers into havens of peace, harmony, quietude, and loving kindness. It is up to each of us to become the pole stars of enlightened behavior. Elaine has been a student of Tibetan Buddhism for 33 years, and raised a family of three. She founded and, for 18 years, ran a home-town copy shop and graphic design business in Boulder Creek, California. She was a founding member of Vajrapani Institute and served as its Executive Director for 5 and a half years prior to retirement in October 2009. On December 30th, 2010, she will enter a three-year silent retreat together with her partner, Keith Emmons.